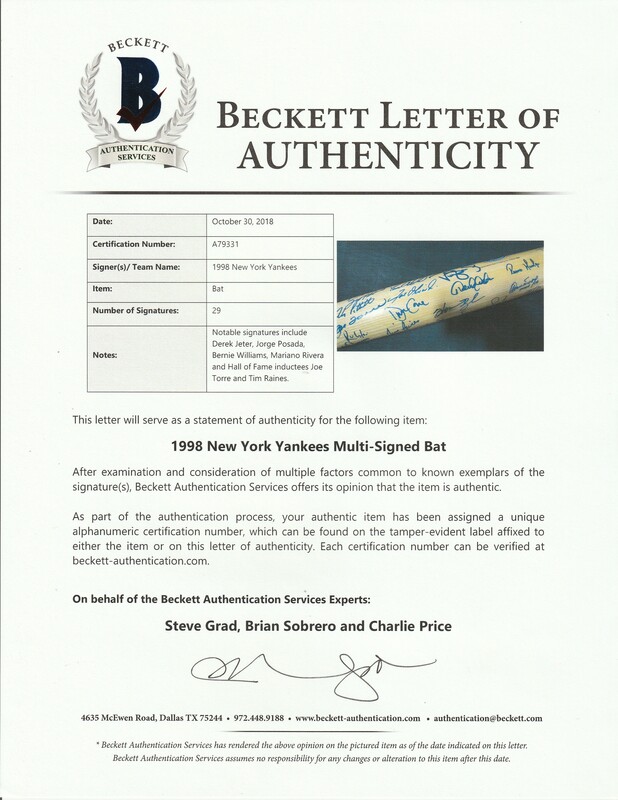 Offered here is a bat signed by 30 members of the 1998 World Series champion New York Yankees. The signatures on this bat include the Hall of Famers Joe Torre and Tim Raines, as well as Derek Jeter, Mariano Rivera, Jorge Posada, Andy Pettitte, Tino Martinez, Scott Brosius, Ricky Ledee, Don Zimmer, Graeme Lloyd, Willie Randolph, David Wells, Luis Sojo, Chuck Knoblauch, Jose Cardenal, Paul O’Neill, Joe Girardi, David Cone, Darryl Strawberry, Homer Bush, Shane Spencer, Mike Stanton, Bernie Williams, Ramiro Mendoza, Orlando Hernandez, Jeff Nelson, Chris Chambliss, and Mel Stottlemyre. The signatures on this Cooperstown Bat Co. commemorative bat have been signed in blue marker. This bat is a limited edition 54 of 98. It is accompanied by a LOA from Steve Grad of Beckett Authentication (A79331).